Team Sisters of Mary with Jeff Foxworthy on The American Bible Challenge. Courtesy Grace Hill Media. Three religious sisters are participating in a unique evangelization effort by competing on a Bible trivia game show in hopes of supporting their community. “This isn’t something we would normally do, but when the opportunity arose, Mother (Assumpta Long) discerned that it would be good not only for the benefit of our community, but also for the New Evangelization,” Sr. Maria Suso of the Dominican Sisters of Mary, Mother of the Eucharist told CNA March 15. Team Sisters of Mary will be featured on the March 21 season premiere of The American Bible Challenge, hosted by comedian Jeff Foxworthy on Game Show Network. Facing off against Team Preachin’ Divas, a group of women dedicated to inner city outreach in Oakland, Calif., and Team Anointed Ink, a group of Texas-based tattoo artists who cover up questionable body art with religious symbols, the Sisters competed for a chance to win $100,000 for their charity of choice. “We met the other teams and it was beautiful to see their love for the Scripture and their dedication to Christ,” Sr. Suso said. 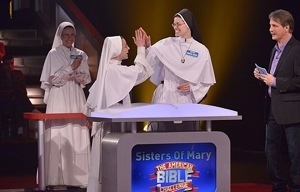 Although Sr. Suso could not reveal how far she and a few of the community’s novices, Sister Peter Joseph and Sister Evangeline, advanced in the game show – which has already been filmed – she did say that they all had “a lot of fun” competing to win money for their rapidly expanding order. Founded in 1997 with just four sisters in Ann Arbor, Mich., the Sisters of Mary, Mother of the Eucharist have now grown to 120 members. The order’s habited sisters are specially committed to Mary, the Blessed Sacrament and the New Evangelization. A deeper aspect of that mission is to help other people discern their vocation, Sr. Suso said. Although she and her teammates were chosen to compete because of their knowledge of the Bible, Sr. Suso said preparing for the show gave them an even deeper appreciation of Scripture. She explained that Catholics tend to focus on the “basic idea and the content” of Sacred Scripture rather than the small details.